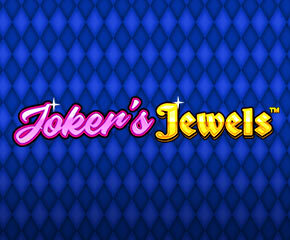 Joker’s Jewels is a Pragmatic Play slot having 3 rows, 5 reels and 5 paylines. The slot has a jester theme with much of fast-paced action. It is playable from 5p up to £25 for every spin. Did you find Joker’s Jewels? 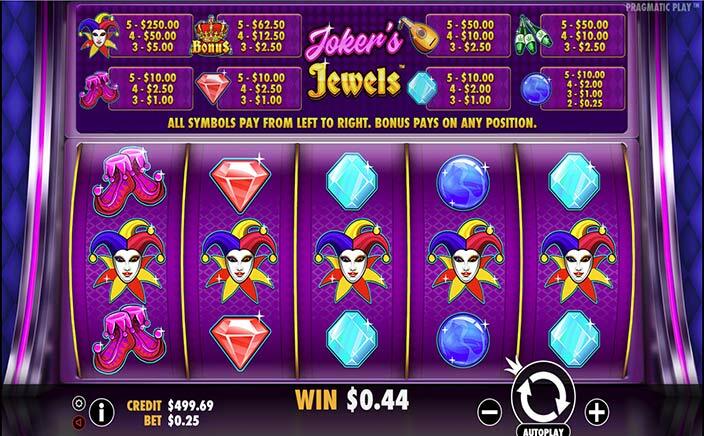 The purple coloured plain reels of Joker’s Jewels can be seen within a cabinet and they contain some gemstone symbols along with some objects which are associated with a jester. The pale blue and dark blue coloured gemstones will award a payout worth 40, 8 or 4 times the bet amount on landing 5, 4 or 3 symbols on an enabled payline. The jester’s shoes and red coloured gemstones will pay 40, 10 or 4 times the stake. The juggling clubs, as well as the lute, are the most lucrative symbols that can pay you up to 200, 40 or 10 times the bet amount on landing 5, 4 or 3 symbols in combination. The jester himself will award 1,000, 200 or 20 times the bet amount if you land 5, 4 or 3 symbols on the paylines. The paytable can be seen flashing constantly which will keep on notifying you about the winning combos. An ‘Autoplay’, the option is present that will spin the reels automatically for a decided number of times. So, once you hit the ‘Autoplay’ option, just relax and watch the reels spinning. The crown acts as the scatter symbol which will pay 250, 50 or 10 times the bet if you land 5, 4 or 3 onto the reels and that too on same spin. Well, if you are looking for any feature that the scatter symbol has the ability to trigger, you won’t find one as there aren’t any here actually. The variance here ranges from medium to high. There is a return to player percentage of 96.50%. With simple as well as straightforward gameplay, it is a good opportunity to grab. But if you are looking for simple action in a retro style, then you should go for Joker’s Jewels positively.